*This post contains affiliate links. I may make a commission, but all recommendations are my own. The first part of minimalism that people think about is the stuff. While minimalism goes far beyond just decluttering your house, this is often the starting point for most people. Maybe you choose to go through a big downsizing process, like we did. Perhaps you simply start clearing away some of the excess stuff in your life. Either way, the less property and materials you have to maintain, the more time you will have on your hands. Honestly, imagine if you could even cut that time in half each month. What could you be doing with an additional 900 minutes per month? Probably a lot. You could start planning your next trip or even spend the day exploring local hiking trails. When you first start your minimalist journey, chances are you will have a lot of stuff to get rid of. This is the best time to get your travel fund started! Depending on what you’re selling, you stand to make some substantial money by selling your things. Beyond just having a garage or yard sale, here are my recommendations for cleaning house as soon as possible. Furniture and other big items: Facebook Marketplace. We were able to sell numerous big items on Facebook Marketplace in only a few days and made around $1,000 doing it! Electronics, DVDs, and CDs: When you have a ton of items to sell like these, I recommend trying out Decluttr. You can get a price right away, send off all of your items at one time and then wait for your check or online payment. It’s really that simple! Read all about Decluttr. Clothing: Besides regular consignment shops, there are great online consignment shops like Swap.com that pay you for your gently used clothing. If you really hope to have the freedom to travel, start getting funded by clearing out some of your old, unused items. Not only will you have a travel fund started, but you will also be creating a more breathable living space. 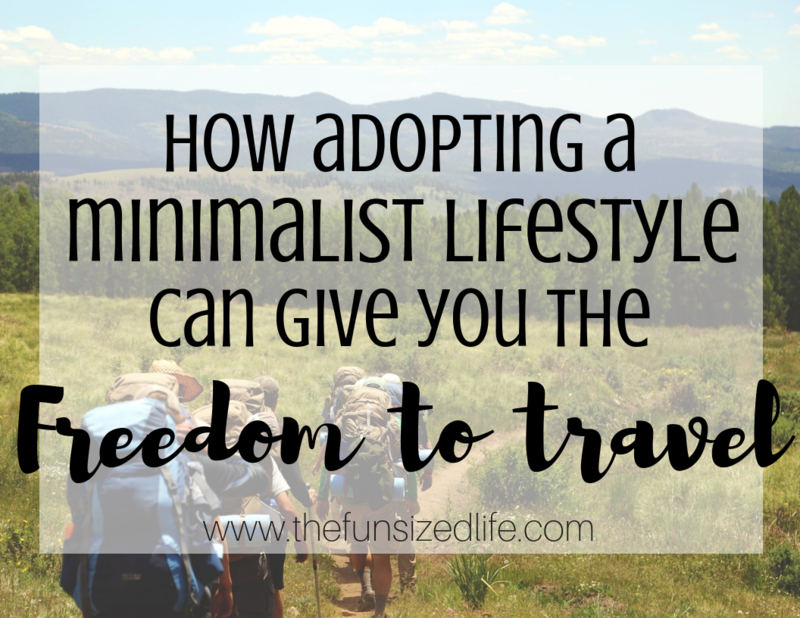 A funny thing happens when you start a minimalist journey. Thinking smaller allows you to think bigger. By decluttering unnecessary things in your life and home, you start to see the big picture of your life more clearly. When you start to remember how much you want to travel and see the world, the desire to spend your money on other things that will just re-clutter your home and life seems unnecessary. Think about your purchase for at least a week. Slow down and think about each purchase you make. Often times the desire to spend money fades over time and you become aware that it wasn’t something you needed in the first place. Ask yourself if it’s getting you toward your final goal. Sure, something like a passport is going to be pretty helpful if you plan to travel the world, but not all purchases are going to be helping you. Take a moment to ask yourself if a purchase helps you, or hurts you in your pursuit. If you are hoping to become a consistent traveler, hosting your home on AirBNB could be a great way to make money while you’re gone and help fund your next travel adventure. The best AirBNBs (in my opinion) are the ones that have a very clean, decluttered space. It instantly makes fellow travelers feel welcome and make themselves at home. You can also check the AirBNB calculator to see how much money you could be potentially earning each month. I know the idea of having people stay in your home can make people nervous, but AirBNB really has great options to keep your home secure and offers $1,000,000 insurance policy to homeowners. Get more tips on how to be a successful AirBNB host. In one of my favorite books, Present Over Perfect, the author, Shauna Niequist talked about how after spending a few weeks at her family cabin, she realized just how little stuff she actually needed. Because she also spends a lot of time traveling and attending different speaking events, she quickly realized just how little clothing she needed. After always purchasing new, fun, brightly colored clothing items it occurred to her that she never actually wore them. Finally, she embraced her neutral colored wardrobe and stopped spending her money and efforts shopping for things she wouldn’t ever actually wear. Downsizing your wardrobe and getting clear about what your style really makes packing that much easier. When all you own is your absolute favorite things, it makes dressing and packing for travel that much faster. Most of what we’ve talked about have to do with materials in your life. What people don’t realize is that a minimalist mindset can also begin to free up your schedule. When you are clear about the things you truly want in life, it becomes easier and easier to say no to the things that you don’t want. Don’t do things you don’t like. Pretty simple, right? Saying no can be tough, (at least it was for me) but trust me, it is the most freeing word in the entire English language. As a former people pleaser, I said yes to far too many things that only added to my stress and the mental clutter in my head. The more you work to open up your schedule, the more you open up your life to have the freedom to travel and experience new things that only stand to enhance your life each day. So, go ahead and start living the life you really want.